The dust has settled not only on the humiliating defeat that Sri Lanka faced at the T-20 in October but also on the bitterness that fans felt over the loss. Just a few weeks before though at another cricket match, it did not matter who won or lost, but that a game was played, with strong bonds being forged for national unity and the promise of a continuing alliance to strengthen the north-south dialogue. A historic occasion it was when Ananda College, Colombo, met Hindu College, Jaffna, at a first-ever ‘wielding the willow’ encounter on the Ananda grounds on September 7 and 8. It all started with the preparations for the 125th anniversary celebrations of a national school in Colombo, viewed as a typical “Sinhala Buddhist school”. With a series of events being planned by Ananda College for 2011 when it would turn 125, Old Boys’ Association (OBA) President Thilak Karunaratne had suggested in 2009 that a comprehensive history of the long years of the college should be put on paper. The dusty and yellowed archives had brought to light that many non-Sinhala Buddhist teachers, both Sri Lankans and Indians especially from Kerala had contributed much towards the growth of the school. “It surfaced that there were heaps of teachers from Jaffna,” Mr. Karunaratne told the Sunday Times. But one name came up “prominently” and that was of V.T.S. 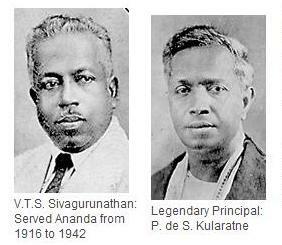 Sivagurunathan who had served Ananda College from 1916 to 1942. “He was an icon,” says Mr. Karunaratne. It was in his memory that the OBA decided to link one of the most prominent Buddhist schools in Colombo with one of the most prominent Hindu schools in Jaffna through the most popular game in the country – cricket. There had been nothing except enthusiasm among the school authorities and the old boys about building bridges between Ananda College and Hindu College, icons on their own of the Buddhist and Hindu communities in the country. Bridges built on old foundations, to provide opportunities for students, staff and parents to cross over the invisible barriers that have built up over the last few decades, is how the encounter has been described. The contacts began then, with the Colombo branch of Ananda’s OBA sounding out the President of the Hindu College OBA branch in Colombo, S. Raghavan, who had been excited about the idea from the beginning. The ball moved quickly thereafter, with the cricket team of Jaffna Hindu College, captained by V. Jasminian and accompanied by Principal V. Ganesarajah, coach and other teachers coming down to Colombo and taking up lodgings at the Ananda hostel for three days. Not limited to the cricket field, it had been celebration time with a sumptuous dinner being arranged by ‘Match Organizing Committee’ Convener, Deva Rodrigo, at the Taj Samudra Hotel on September 7 and both teams boarding the Ananda bus for a fun-filled day at Leisure World at Kosgama on September 9. The dinner where Hindu College alumnus and Supreme Court Justice K. Sri Pavan was the chief guest had been especially poignant when the Hindu College cricketers “mobbed” the Anandian national cricketers Thilan Samaraweera, Thilina Kandambi, Dinesh Chandimal and Sachitra Senanayake for photographs and autographs. The highlight of course had been the ‘Inaugural Sivagurunathan Trophy Cricket Encounter’ between the two schools during which Ananda College Principal L.M.D. Dharmasena had spoken in Tamil and Jaffna Hindu College Principal Ganesarajah in Sinhala. It was a first for both Ananda and Hindu Colleges, for never had they met any team from Jaffna and vice versa on the cricket field before. For almost all cricketers from Hindu College it had been their first trip to Colombo. An article titled ‘Back to the Future’ dwells on the Ananda-Hindu Colleges’ ties of yore which are linked to national endeavours. It states: “The Jaffna Youth Congress (JYC) that had its origins in 1924, was inspired by the Indian independence movement and stood for a free and united Ceylon committed to universal values and ideals. Two of its leading lights, Handy Perinbanayagam and C. ‘Orator’ Subramaniam were products of JHC. The strength of the links between the JYC and the south can be gauged by the fact that, at its second annual sessions, Ananda College Principal P. de S. Kularatne was proposed to the chair by Subramaniam. Kularatne was reported to have ‘kept the visionary youth spellbound with his speech for more than an hour. He underlined the three aims of the Congress: To revive national art, literature and music; to make Ceylon economically independent, and to train the young for national service in particular and to work for the realisation of the ideal of a United Ceylonese Nation’. The similarities between the two schools, the Sunday Times learns are that both Ananda College and Jaffna Hindu College were formed around 125 years ago to uplift the children of Ceylonese parents who could not provide a modern education in English to their sons, either due to social circumstances or financial limitations. It was clear to the founders of the two schools that if the deprived Ceylonese were to rise up to hold positions of responsibility in the Colonial Government, the academia, the professions or the mercantile sector, they should be afforded the opportunity to study and excel in English. 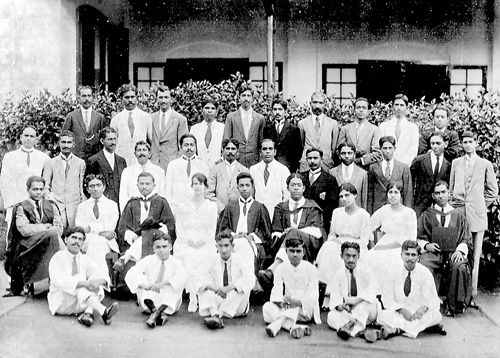 In 1935, an OBA branch of Ananda had been set up in Jaffna with 55 old boys.�However, what had come into strong focus had been the role played by non-Sinhala and non-Buddhist Sivagurunathan at Ananda College. Among the onerous duties handled with equanimity by this versatile personality had been those of class teacher, teacher of Tamil to Sinhalese students, headmaster, planner of time-tables, supervisor of the teaching and learning process, archivist, chronicler to name a few. While it had come to light through the speech of old boy and former Ambassador in Sweden Lal Kurukulasuriya during the dinner that Principal Kularatne opened the doors of Ananda College to deserving but impoverished children from all parts of the country, Sinhalese, Tamils and Muslims and others, through a scholarship programme, and gave refuge to teachers thrown out of missionary schools for daring to start Buddhist activities in them, it had been no-nonsense Mr. Sivagurunathan who worked alongside the likes of the Most Reverend Ananda Maitreeya Maha Thero to introduce the teaching of Tamil as a second language at Ananda, at a time when children were fined for speaking in Sinhala in missionary schools. Now the celebrations and speeches are over but the links will remain, assures a former cricket captain of Ananda College, Sanjiva Senanayake, with academic and teacher exchanges between the two schools and other joint sports events on the cards. The annual fixture on the calendar will be the cricket encounter, with the Ananda team heading for Jaffna in April or May 2013. It will also not be limited to these two schools, says Mr. Senanayake as the OBA has already sent out messages to Dharmaraja College in Kandy and Mahinda College in Galle to have similar “connections” with the north. Another interesting aspect is the spadework being done by old Anandian Imthiaz Bakeer Markar to forge bonds between Ananda and a Muslim school from the Eastern Province. Measures are also underway to adopt a school in the Wanni. With rain putting the only damper on the cricket encounter that momentous Friday in September, the Ananda team led by Thushara Samarakoon had won the match, with Hindu College, which had never played turf cricket only on matting, collapsing in the second innings. The verdict of everyone involved, however, is that it was not about who won or lost but that the game was played and played well.